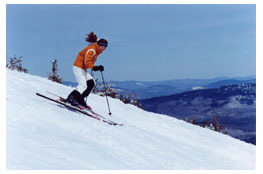 Maine may be best known for coastline and crustacean, but Maine’s mountains offer some spectacular scenery and skiing. 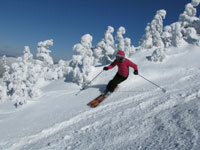 Maine ski areas range from major ski vacation destinations to small community operated hills. Here are Maine’s Best Ski Trails and Top Picks in the Pine Tree State. No contest, no crud, just dry light manufactured snow. With, The River has made a Halloween habit of opening first in New England, and closing often on May Day. With 1,900 guns a blazing and 72 miles of pipe feeding 2,200 strategically placed hydrants, the Snow Team blankets 92% of The River’s eight peaks, then resurfaces (fancy term for blowing more freshies onto snowmaking trails all winter long) to the delight of first track skiers. But don’t take my word for it, take a Snowflake Factory Tour at Sunday River to see the most technically advanced snowmaking system in the East. A fleet of 15 Bombardiers and two 8-hour shifts each night assure that the slopes are buffed to baby bottom smooth. The white carpet each morning is seamless from edge to edge on as much as 80% of Sunday River’s terrain, that’s about 696 acres of corduroy. This pristine part of western Maine, while a bit of a trek, rewards travelers with incredible views of the Bigelows from Sugarloaf’s ski slopes. Honorable Mention Saddleback – currently closed awaiting new ownership. Saddleback Lake and Rangeley Lake seen from Saddleback’s summit elevation of 4,120’ are awesome. Saddleback’s grand lodge at 2,460’ has spectacular scenery even for the non-skiers who choose to sit by the giant fieldstone fireplace. The River is dialed in to the freestyle movement with its multiple park and pipes with features galore including Simon Dumont’s T72 terrain park trail on North Peak. The River’s Park Rangers keep things orderly and they organize rail jams or no-bib jibs almost weekly. Honorable Mention Lost Valley – For a ski hill with 240’ vertical, this L.A. area (Lewiston/Auburn) rocks with school age kids riding rails and doing trick into the twilight hours at Lost Valley. To start, you have to earn your turns with a half-mile traverse (snowboarders read: hike) along the Dazzler trail. The scenery is dazzling, complete with frosty snowghosts. The reward –a steep, stumped, twisty trail that epitomizes good old fashioned black diamond skiing that Saddleback serves up with humility, along with Casablanca Glades nearby. Perfectly pitched runs like Sunday Punch or Risky Business on Barker, American Express off Spruce Peak, Rogue Angel and Excalibur off Jordan are all intermediate heaven, blue squares with blue skies above and mountain vistas in the distance. What more could a skier ask for? A conveniently located chair to whisk you back up so you can repeat the rhythm that is Sunday River skiing. Kids will love the Dudley Do Right trail theme; Rocky, Bullwinkle and Boris Badanov are all represented at Mount Abram. Moms and Dads will like the reasonable ticket prices and the Loose Boots Lounge in the lodge. Fun stuff like NASTAR racing keep it entertaining on this humble hill that most skiers pass by on their way to Sunday River. The Foggy Goggle is the place to see and be seen, and maybe hook up after you hang up your skis or board. There’s live music at après ski and a view of the slopes, and with twilight skiing at Sunday River this season – you can opt for ski goggles or beer goggles, depending on where the snow bunnies are burrowing. Loafers are loyal to their mountain and to their beverages at the Bag, The Widowmaker, Gepettos or The Sugarloaf Inn. At any of these après establishments, you will find a friendly crowd, cold beer and tasty food (nothing too sophisticated but always satiating). There’s typically entertainment too, Uncle Al & Kenny are an institution Fridays at The Sugarloaf Inn. You can go in your ski boots, Sugarloaf is not a dressy scene – leave your fluffy boots and fur at home – unless you bagged a deer on your way here and want to show it off. Seth Wescott is the brains behind this memorabilia-filled brew pub that opened the season following his Gold medal Olympic boardercross. The Rack is the place to watch sporting events and watch the door for pro skiers and riders coming in for a beer and bbq ribs. The Bridgton mountain with those incredible lake and mountain views has a far-ranging menu of ticket-saving options from skiing at night to loading the car with friends. Shawnee Peak Carload Dayz are $75, there are two-fer Tuesdays, night skiing deals ($12 select Saturday nights and more) and $25 Sunday afternoon rates. Honorable Mention Powderhouse Hill in South Berwick, where five bucks provides access to three natural snow trails and 175 feet of vertical. It’s a veritable museum with the rusty 1938 Ford V8 that once powered the rope tow still in place. Bring the credit card for Maine’s Coast after you ski at Camden Snow Bowl. Make a few runs on this scenic ski hill, The Lookout trail offers a glimpse of The Atlantic, then make waves to the boutiques and shops that line the seaside village of Camden. Shawnee is the largest night ski facility in all of New England. With 19 trails lit up every night except Sunday, plus a freestyle terrain park under the lights, sneaking to the Peak for a little evening exercise is fun for the whole family. Monday Night Madness lift tickets are just $12 from 4-9pm. Blizzard’s Pub is open for pub fare, with a view of the slopes and entertainment many evenings at Shawnee Peak. Spruce, in Jay, is town-owned and run by volunteers. It takes three consecutive rope tows (and several mittens each season) to get the full 300’ vertical of vintage skiing. This 11 trail ski hill offers a total flashback experience of 1960’s skiing – when Spruce opened. Volunteers cook up a storm of delicious homemade soups and stews, and serve them at reasonable rates. When’s the last time you enjoyed steaming turkey stew with homemade dumplings before a big fieldstone fireplace among ski friends? Sounds better than the greasy burger and fries in the cafeteria line. Titcomb is a 750’ ski hill operated by the Farmington Ski Club since 1939. The first big mountain in Maine you come to after a 3+ hour drive from Beantown. The good news is the conditions at Sunday River are reliable, and their lifts are open till 9pm on weekends, so you can get 12 hours of skiing for your round trip 7 hours of driving.